Every tefillah counts... as does every kernel of popcorn. 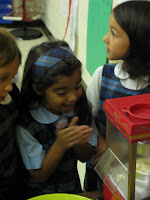 Each morning as the second grade davens, Morah Deena Yarmush walks through the classroom with kernels of popcorn. 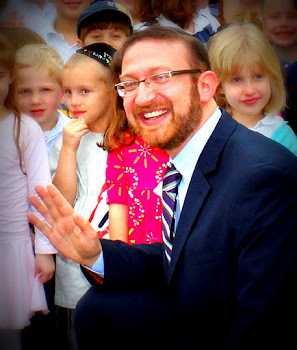 On the desk of each child is a plastic cup into which Morah Yarmush will drop a few kernels of popcorn when the child is davening nicely. But davening, of course, is much more powerful when done bi-tzibbur, together with others. 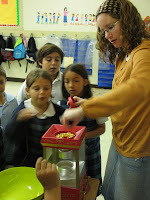 Therefore, when the second grade finishes davening, the popcorn kernels from each cup are poured into a jar representing the tefillot of this special tzibbur. Of course, popcorn kernels aren't much fun unless they're popped. So, when the jar fills up it's time to pop them and for a tefillah popcorn party. Today was the first of what we hope will be many such parties. Yasher kochachem, second grade!